UCMP’s fourth home, the Earth Sciences Building (now McCone Hall) in a 1975 photo by J.C. Catton, call no. 14N:1 courtesy of the Bancroft Library. 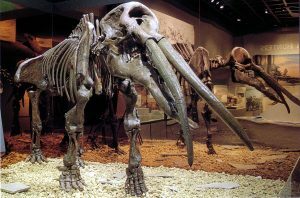 For more than 100 years, paleontology in the US had been steeped in the tradition of description and stratigraphy out of necessity, with some exceptions dealing with the history and development of the biota. This of course continued at Berkeley, but as the next decades unfolded, a more biological emphasis developed. In 1955, the Department had six paleontologists on its staff covering all subdisciplines of paleontology. Two years later, the department hired Zach Arnold, a protozoologist working on foraminifera. This first step into paleobiology was continued with further hires in functional morphology of vertebrates and invertebrates, paleoceanography, paleoecology, evolutionary paleontology, and paleobiology. These faculty hires replaced previous faculty who retired, passed away or moved to other places, thus maintaining a level of seven paleontologists in the department. 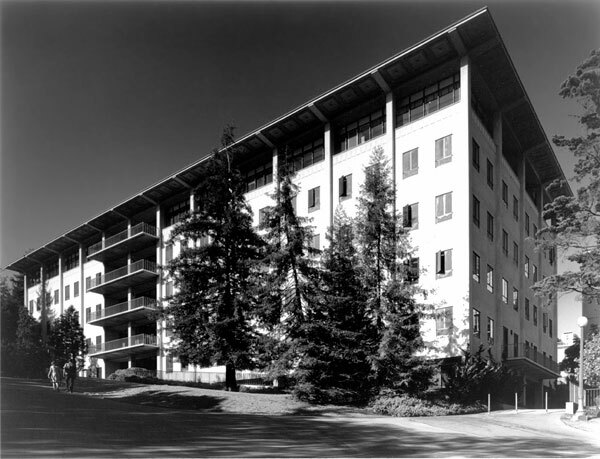 During this period from 1960 to 1989, UCMP and the Department moved once again into the new Earth Sciences Building (right) together with Geology and Geography (1961). Under the leadership of Director William Berry (1975-1988), outreach was established as an important activity of UCMP, the collections began a long period of computerization, the collections were provided adequate housing, the Friends of Fossils organization of interested people was established, the Young People’s Lecture Series was started, an enormously successful UCMP Open House took place each year, the Blackhawk fossil quarry in Danville was acquired assuring its preservation, an agreement was reached for a major UCMP Hall in the proposed Museums at Blackhawk in Danville was reached, and an annual conference of all paleontologists in the University of California (all campuses) was initiated and later changed to include paleontologists from any college or university in California (Gregory 1998). 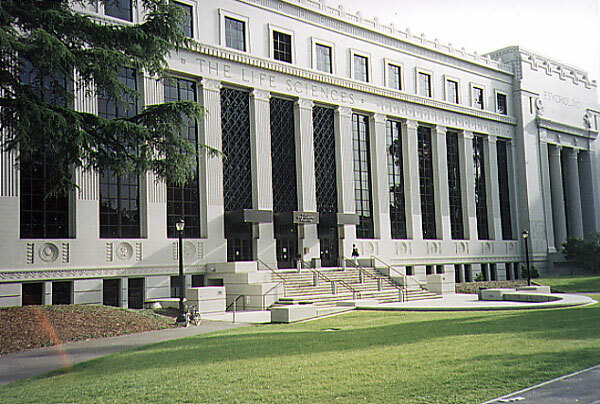 Importantly, Berry was involved in campus discussions on the reorganization of biological sciences at Berkeley, and he negotiated for new Museum of Paleontology facilities in the proposed renovation of the Life Sciences Building. Berry became the first Director who was also Chair of the Department in over two decades since Stirton last occupied both positions in 1955. The joining of both administrative positions brought paleontology together as a whole, with research and academic goals intertwined. This work was continued and expanded by later Directors. 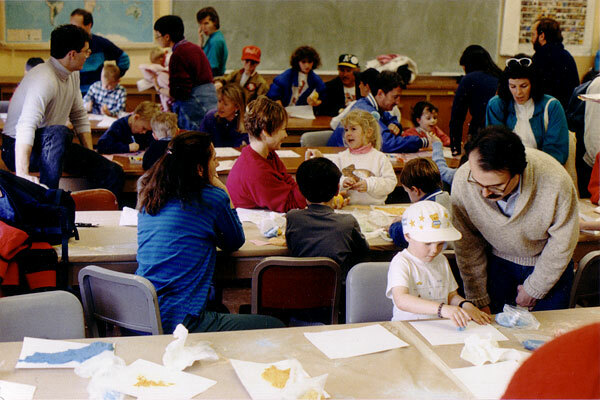 UCMP has held annual open houses since 1977, long before the campuswide Cal Day open houses began. 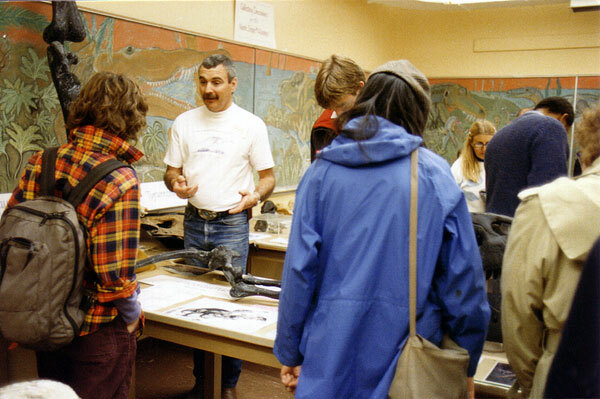 Photos from the May, 1990 open house, from left: In one room, Museum Scientist Mike Greenwald talks to visitors about fossils from the La Brea tar pits. Photo by Mark Goodwin. Children build Play-Doh® dinosaurs, color dinosaur illustrations, and draw prehistoric scenes. Photo by Mark Goodwin. 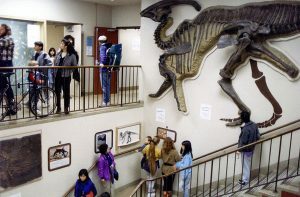 Visitors inspect the hall and stairway exhibits, including the wall-mounted Parasaurolophus in the Earth Sciences Building (now McCone Hall). Photo by Mark Goodwin. The reorganization of biological sciences changed a good deal for paleontology. The Department of Paleontology was disestablished and included with other biology departments in the reorganization. A new Department of Integrative Biology was formed in 1989 by the merging of faculties of paleontology, zoology, botany and other biology disciplines into a single large department. The paleontology department had seven faculty members at that time, six of whom joined the new biology department and one who joined the Geology Department but remained a faculty curator in UCMP. Although they joined new departments, the faculty and students remained in the Earth Sciences Building (now McCone Hall) while awaiting the renovation of the Life Sciences Building. In 1995, the faculty in the merged Department of Integrative Biology moved into the renamed Valley Life Sciences Building, along with UCMP, the Museum of Vertebrate Zoology (MVZ), the University and Jepson Herbaria, and the Biosciences and Natural Resources Library. The move of UCMP took most of a year with just the moving vans and crews working eight hour days for nearly six weeks, shuttling the short distance between McCone Hall and VLSB. 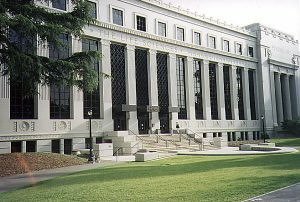 In this same period, the University of California budget was decreased about 20%, which resulted in early retirements, layoffs and financial cuts in most programs. The early 1990’s were years of turmoil as the departments and museums adjusted to these rapid changes within the university and their own settings. Faculty and students found themselves in new relationships to their colleagues, the collections were closed and moved over several years, and budget restrictions affected everyone. UCMP, although suffering the loss of some staff and budget, received no cuts deeper than those imposed on other units of the university, thus preserving its integrity and strengths. It lost one faculty curator and several museum staff who chose early retirement. In spite of the turbulent times during the early 1990’s, UCMP took on a new role as an independent research organization not directly associated with a department, as it had been for several decades. Now it provides services of various sorts to a wide diversity of users as described above. It maintains close affiliations with the Department of Integrative Biology as many of its faculty curators and most of its graduate students come from that department. However, it operates separately from any other unit, although it is a member of the Berkeley Natural History Museums (BNHM). In 1994, the Museum of Paleontology, MVZ, the University and Jepson Herbaria, the Essig Museum of Entomology, and the University of California Botanical Garden joined together with the help of the Vice Chancellor of Research to form the BNHM. The BNHM is a powerful consortium sponsoring lectures, workshops and research projects, and facilitating student interactions. The campus administration recognizes the importance of the museums as unique research, teaching and outreach organizations that few universities anywhere have. A mounted Gomphotherium simpsoni skeleton at The Museums at Blackhawk in the early 1990s. photo courtesy of The Museums at Blackhawk, photo by Francis Sakamoto photo by Francis Sakamoto courtesy of The Museums at Blackhawk. UCMP also provided fossil displays at several venues: the Petrified Forest National Park, the University of California at Davis, the California Academy of Sciences, the Doe Library on campus, and the Big Fresno County Fair, where attendance was over a half million visitors at UCMP’s exhibits. The President of the University acknowledged the role of the Museum and University in Central Valley affairs with a special message to the citizens made through the museum’s exhibit. UCMP aided in the establishment of the Stewart Valley Fossil Site under the auspices of the Bureau of Land Management. As the University began an association with the Museums at Blackhawk in Danville, California, UCMP began a fossil exhibition, following the negotiations of three directors over nearly a decade. A well-designed hall for paleontology (“Explorations of Ancient Life”) was developed and displays mounted (above right), with its grand opening in 1991. The paleontology exhibit hall was very popular with schools and the public, with attendance of over 50,000 each year. Although the paleontology exhibits were scheduled for a three-year run, the hall remained open to the public for over six years. The Museums at Blackhawk ran an extensive outreach program, with lectures and workshops done in association with UCMP. A particularly successful outreach effort was a community dig at the Blackhawk Fossil Quarry near the Museums run by UCMP and the Museums at Blackhawk. Families came on the weekends in the summer to dig for fossils, which were then curated into the UCMP collections. The visitors did not mind as their work was valued by the museums. Later, the Blackhawk Quarry was part of the “Trail through Time,” a collaborative effort of UCMP and the Mt. Diablo State Park and its volunteers (1995). Trails were marked that led through the rocks exposed on the flank of Mt. Diablo, from late Miocene to Jurassic in age, some 150 million years of geologic time. Each year, a Trek through Time (below right) along the Trail hosted many hikers. Negotiations are now underway with the Mt. Diablo State Park to transfer the Blackhawk Fossil Quarry to its ownership and care. 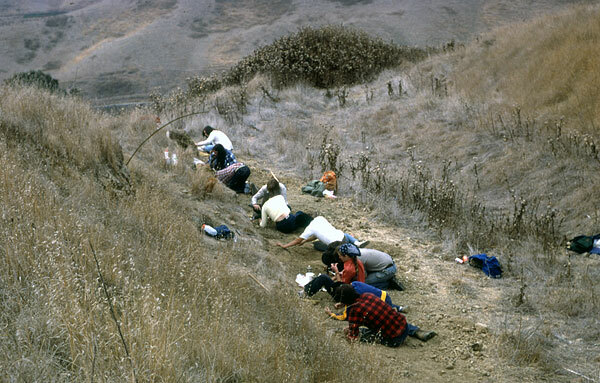 A paleontology class makes a field trip to the Blackhawk Quarry to do some minor excavation in 1981. Photo by Bill Clemens. UCMP also promoted international activities. It sponsored several major scientific meetings during the 1990’s: American Malacological Union 1991, Forams 1994, and the North American Paleontology Convention 2001. New collaborations with the Paleontological Institute of the Russian Academy of Sciences started in 1993 with an exchange of scientists and students. As part of this, Berkeley students were supported by the Graduate Division for work related to their research. The Museum has its own publication, PaleoBios, where scientific reports may be published. It is widely distributed to countries all over the world. As the budgets were restored in the following years, UCMP recovered its full complement in paleontology staff and facilities. Indeed, the paleontology program, centered on UCMP, was judged number one in America by U.S. News and World Report (1999), an honor that the campus administration is proud of. The paleontology faculty, staff and past students continued to demonstrate their involvement in the affairs of international societies of paleontology. Many Berkeley paleontologists were honored with the Paleontological Society Medal, membership in the National Academy of Sciences, and other awards. In all ways, UCMP has been a success story.